ProVu Communications - Snom 220 - VoIP SIP Phone - Call over IP. Call Log - 100 incoming, outgoing and missed calls. Call hold, divert and transfer, with consultation. The phone software can be upgraded remotely and central administration is available. Voice Mail with message waiting indicator. Call SIP addresses over the internet for free. Open Standard - compatible with all other SIP devices. More flexible than a traditional PABX - not limited to where you can run phone cable, but can still provide all the features you expect from a traditional PABX. 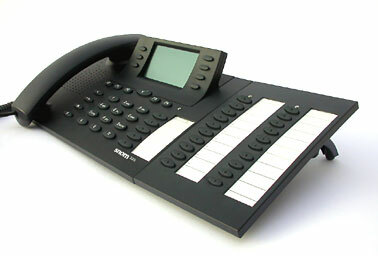 Completely scalable - the intelligence is in the phone so never full to capacity. Calls are made to a Personal identifier. Logon to your identifier from any location.